Resources | Mining Association of Manitoba Inc. The following links provide direct access to some of the most useful tools available from the Manitoba Geological Survey. Combined, the first two links provide access to virtually all publicly available data related to Manitoba mineral exploration. The third link provides a quick summary of the survey's projects currently underway. Provides a map interface to find the following information. To see what information is available, select the Layer List menu and select the specific items of interest. Most items of interest are under the first item "Mineral Dispositions". To find out more information about any item on the map, select the Drill Down menu ("circle I" on the menu at the top of the page) and use the individual point tool or area selection tool to select the targeted information. Provides an index of all geological reports and maps ever produced on Manitoba. Many reports generated by Manitoba are available for PDF download. If you have a specific region in mind, you can simply search by NTS number (see map). 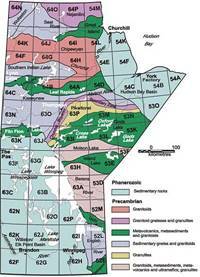 See where the Manitoba Geological Survey is currently conducting its studies. Extractive Sector Transparency Measures Act (ESTMA) is a new piece of legislation requiring certain extractive companies to report certain payments they make to governments at home and abroad. Many of you may be required to report under ESTMA for their current financial year. For more information, please click here. Mining Association of Manitoba Inc. Copyright © 2019 Mining Association of Manitoba Inc.